Why are you an artist or how did you choose to become an artist? My grandmother in Santa Fe used to encourage my drawing, painting, and coloring, and bought art supplies for me every summer when I was little. In third grade, I won an art competition at school. My prize was two tickets to the circus. As the oldest of six children, I loved being able to take my dad on a date to the circus on my winnings. Where do you paint? Home, studio, corner of a room? My studio is a bedroom in my house. I love being able to paint in my pajamas, or between loads of laundry. How is it set up? I have easels at both ends of the room. I like having two paintings going at the same time to prevent overworking one of them out of pure frustration. I commissioned a cabinet maker to make me a blueprint file on wheels. 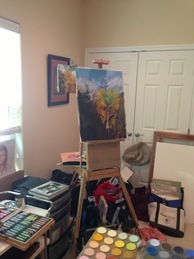 I keep my studio set of pastels on top of it, and my paper and boards in the 5 drawers. I also keep my PanPastels out, on TV tables. I use two studio trays from Dakota for my complete set of Great American pastels. My work in progress is on one wall so that I can study it at a distance. What is your subject matter and how do you choose it? I like to paint trees, meadows, skies, and water. Rocks and cliff walls are also fascinating. In my studio I paint from iPhone photos. I also have a Nikon Coolpix camera that fits in a pocket. Sometimes I print my photos out on my ink jet printer. Sometimes I bring them to my local mailing center and have them printed out on a color laser printer. Sometimes I just paint from my phone or iPad. I try to spend one day a week painting from life in the summer, and one week painting outdoors during the remainder of the year. In the summer I draw portraits in pastel at our local assisted living facility. I give the portraits to the residents in exchange for being my model. What is your art background? Academic, self-taught, workshops? I earned a BA in Art at Westminster College in Salt Lake City in 1977, where I studied still life and portrait painting from Don Doxey. I was lucky to have been superbly taught in high school and college. In 1984 I received a Master of Arts in Religion degree from Yale. As part of my studies, I took a three-semester course in the History of Christian Art, which was amazing. After I graduated, my husband accepted a 3-year job in England that turned out to last for 16 years. During that time, I taught violin in Hertfordshire, one of the Home Counties, within commuting distance of London. I would check out art history books from our local library, and go see the paintings of just the artist that I was currently studying in the National Gallery each week on my way to work. My favorite artists were Van Gogh, Matisse, Rembrandt, Botticelli, Hals, and Van Dyke. My husband attended conferences in all the European capitol cities, and I would travel with him. While he was in sessions, I would be in art museums. I would show him my favorite few paintings at the end of each visit. How do you describe your painting style and color choices? I am a post-Impressionist. Black and brown were my least favorite Crayola Crayons when I was growing up. When I discovered the Impressionist palette in college, I was hooked. I like vivid colors. I am continually learning how to use them. If you paint from life (plein air or a model), describe an interesting or funny experience. When I was painting a PanPastel and Carbothello portrait of one of the residents of Bastrop’s senior home, my model recited Edgar Allen Poe’s The Speckled Band as I painted. He was so interesting that I didn’t ask him to try to be still. I didn’t get the eyes right. I was painting north of Taos in an Albert Handell Paint Along one October afternoon when it started raining. It was one of those brief showers where half of the sky is dark and the other half illuminated. A young tree with white bark was glowing golden in the warm evening light against the royal blue of Taos Mountain. I got permission to set my easel up under a staircase, sheltered from the wind and rain, and I started painting a picture of the tree, vulnerable and yet sturdy. A resident of nearby Taos Pueblo came up behind me and asked if he could watch me paint. I said he could. He watched me paint his beloved land with such intense concentration that I had no choice but to concentrate fully as well. Halfway through the painting, the iPhone in his pocket rang. He answered, saying, “I can’t talk to you now. I’m watching a lady paint.” This is how we are meant to live, to totally immerse ourselves in the beauty of the land and the moment, and to do one thing only, regardless of the demands of technology. What do you consider your best painting ever and why? High Noon was the biggest pastel I had ever done in 2007. It was 18x24 and took me six months, not counting the time I spent with the digital photo as the desktop of my computer, analyzing shapes and values. I learned so much from it about shape, color temperature, edges, movement, and massing to eliminate unnecessary detail. I bought a set of the enormous Sennelier pastels just to keep the sky gestural. I entered it into a local show and it was rejected. I entered it into the Pastel 100 and was awarded an Honorable Mention. I have not been able to sell the painting. I still like living with it, although I might put it under Museum Glass. What art events do you have scheduled? I am doing a demo on Mother’s Day at my Austin gallery, Artworks, 1214 W 6th Street, from 1pm to 4pm. I plan to attend the IAPS Convention in Albuquerque in June. 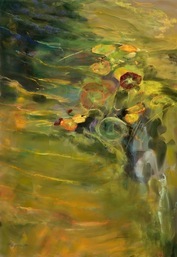 I am especially looking forward to the two-day Sally Strand workshop, as I am fascinated with the color of light. How do you sell/show your work? Galleries, online, home studio tour, open house? I found my Austin gallery in 2008, on the day I received word that High Noon had won an award in the Pastel 100. I walked in, thanked the owner for exhibiting pastels, and told him that my work would soon appear in the Pastel Journal. I gave him my business card. He asked if I had a website. I said I did. I took one of his business cards and e-mailed him a link to my website when I got home the same day. The next day, as I was shipping a couple of paintings to the national show in New Mexico, I got a voicemail from Artworks asking me to bring in six unframed pieces. One of those sold before it was ever hung on the wall, and Artworks has been my main gallery ever since. My husband had given me the domain name enidwood.com for Christmas the preceding year, and we set up my website on New Year’s Day. My artwork is now represented by four galleries in Texas and one in New Mexico. This time last year I had two further galleries in Texas and one in California and was feeling severely over-extended. What is your price range? My paintings start at $45, if I frame them myself. Last year I sold a painting framed by Artworks for $4000. Most of my work sells for between $800 and $1650. Do you have any marketing or exhibiting tips that you would like to share? Spend at least as much time marketing as you do painting. The painting needs to continue, though, no matter how busy you are, or you can’t replace sold work in your galleries. Keep a record of all your finished work. I write the date and title, size, and support in a spiral notebook on my desk. Online shows are good places to show sold work. National shows are worth the time and money because you learn so much and gain valuable exposure. What social media, websites or art-focused groups are you associated with? I use Facebook a lot and Pinterest a little. 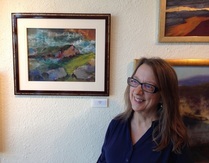 I am a member of Austin Pastel Society, Plein Air Austin, Pastel Society of the Southwest, Pastel Society of New Mexico (signature member since 2013), Pastel Society of America (Signature Member since 2011), Arts for Central Texas (Signature Member), American Women Artists, and American Impressionist Society. What are your goals as an artist? I want to share my joy in the visual by creating works of art. I want to teach artists so that they can express their individual creative voice with genuine skill. What do you hope people gain from viewing your work? I am interested in the beauty in aging and the power of stroke and color to convey emotion. I want to communicate through my paintings. Who or what has been your greatest source of encouragement? My husband is continually supportive. He is proud of my success and kind about my failures. Is there a single incident, a quote, or an award that will always have special meaning to you and why? I have been trying (unsuccessfully) for many years to have a painting accepted in the American Impressionist Society show. I painted a very impressionistic (or so I thought) view of windblown rabbit brush especially for the show. When it was rejected, I entered it into the Pastel Society of the Southwest Member Exhibition in 2011. Doug Dawson awarded it Best of Show. With the prize money, I bought a complete set of Great American pastels. What is your “favorite thing” you use in painting? A special gadget or tool you have discovered or a special technique that you have developed that you would pass on to others? I like starting a painting with metallic Pan Pastels. The glow shines through subsequent layers and rewards the viewer for coming close.